This vegan leather wallet features an inset Buffalo Nickel. This billfold always holds an extra five cents—and a priceless history. 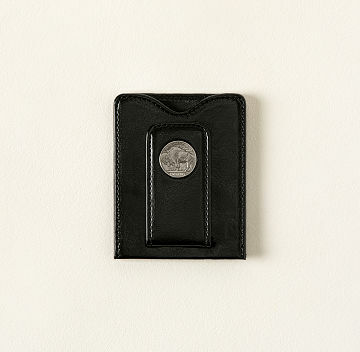 The slim, vegan leather wallet and money clip features an inset Buffalo Nickel. Designed by James E. Fraser and minted from 1913-38, the iconic coin honors Native Americans with its composite portrait based on Iron Tail, Two Moons, and Chief John Tree. The flipside gives the nickel its name with a profile of an American bison. The lightweight wallet has two card slots on the back, an inner pocket, and a magnetic money clip on the front to keep your cash handy. A metal plate sewn into the wallet protects cards' magnetic strips. Each one comes gift-boxed with a Certificate of Authenticity. Made in India. Well designed high quality merchandise. My husband loves this wallet, had one similar for years. Its lightweight, not bulky, can fit in the front pocket for better security, very attractive and he receives many compliments. As expected with leather there is a break in period but totally worth it for him.